instead of letting it rule you? This work of historical fiction combines mystery and fantasy into one great, soulful adventure. At the end of the first millennium, on the eastern fringe of the western empire, in a humble blacksmith shop on the edge of a rich market town, a reluctant apprentice of an alchemist sets out on a visionary quest to solve a mystery, rescue his master and open the doorway for his return to the Universal Essence. In this ancient parable for modern life, the student must turn his ideas about reality upside down to receive the honor and power he desires. The adventure could reward him with death or immortality. 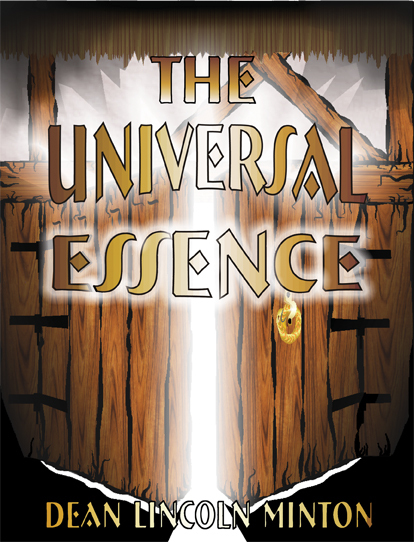 "The Universal Essence" by Dean Lincoln Minton, is a trade paperback book for $18 plus $4 shipping for the first book and $1 for each extra book on the same order. Click here to order from the author. You can also order from Pulpwood Press or your local book store, or online book sellers. Cover and interior illustrations by Cartoons by Deano. A simple stranger? A fool? Jacob didn’t want an apprentice, especially a foolish apprentice. He was happy living alone as the town’s only blacksmith. Why would he need an apprentice? Jacob scratched his bushy white head. How could he be in danger? He was, after all, a master alchemist, connected with all creative powers, detached from all earthly concerns. Not even death could touch him. The only thing that could possibly hurt him was himself. The prophecy came swiftly and silently. “The fool will save you from yourself." Jacob handed the disc to Peter. With his baton tucked under his arm, Peter held the gleaming saucer with both hands. It was warm, heavy and maybe ten times the size of his hand. Its clean, yellow sheen reflected the flickering candlelight. “It ish … so much,” Peter whispered. “We must return it,” the alchemist said. With a flip of his wrist, he threw the platter over his shoulder. It flashed as it tumbled through the air, upward, to the peak of a high arc, and then downward until it splashed into the well. He stood and squinted at the stone tower. Did he close the door without touching it? Of course he did. He used the powers of alchemy. He could make things do what he wanted. He puffed out his chest and imagined another humiliation for Lothair. “My will ish that Lothair be a captive inside.” He held up a hand and spread his fingers as he had seen Jacob do. Just as quickly as Peter’s powers overflowed, his strength drained away. He wilted like a plucked flower. A mist filled his mind and his thoughts wandered, lost in the gray fog. He wanted to lie down and sleep. But Lothair was beating at the door. Everyone in the courtyard; masons, servants and foot soldiers, stopped their work and watched him with frowns of fear and accusation. He limped toward the castle gate, leaning heavily on his baton.